The slider widget allows you to show an intuitive slider with which the user of the WebUI page can specify scalar values between specified boundaries. Please note that the parameter that you specify does not necessarily need to be a scalar one: you can use multi-dimensional parameters, which you can then slice to select a specific fixing of the indices. With the min option, you can specify the minimum value that the user is allowed to select with the slider. With the max option, you can specify the maximum value that the user is allowed to select with the slider. 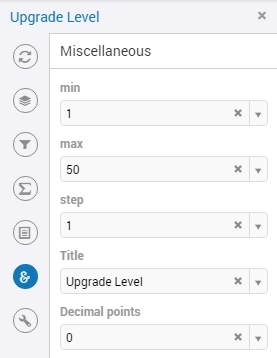 With the step option, you can specify the step size that is used when sliding the value.